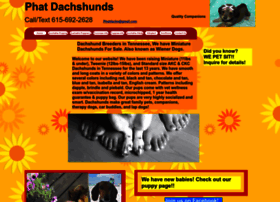 Welcome to our website...we breed miniature and tweenie size dachshunds in a variety of colors and patterns. Smooth, Long,& Wirehair. If you are looking for healthy, well socialized, beautiful weiner dog puppy you have found it. Located in Middle Tennessee.